Keep your outdoor living spaces bug free by plantings these 7 plants that repel mosquitoes! Since we are finally getting settled into our new home I was able to get to the garden center and buy plants at long last…I had been holding off because of our move and it was sheer torture to not get my hands on some potting soil until mid-May! You all know that I try to go all-natural when I can for my family so avoiding chemical insect repellants by using plants was a given! Today I wanted to share a few plants that I like to keep around to help keep mosquitoes at bay. Lemon Balm is a member of the mint family and is another super easy to grow plant (I prefer those because I’m not a natural green thumb!) 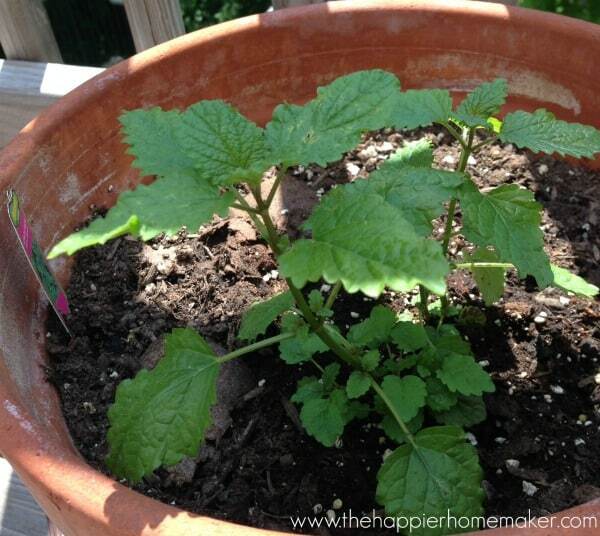 It can be aggressive in it’s spread so I prefer to keep Lemon Balm in a pot to keep it from taking over the yard! You can also use the leaves to make tea! I planted catnip for our kitty but it has the added bonus of being an extremely effective bug repellant…in fact there was a study showing it to be 10 times more effective than DEET! Yay for mother nature! If you keep catnip and have a cat, be sure to separate it from your other plants in case your cat gets a crazy playing around-mine likes to roll all around and always knocked down any nearby small planters! Marigolds have a scent that bug HATE and the added bonus of being easy to grow and lovely to look at. Marigold plants contain pyrethrum, a commonly used insect-repelling chemical found in many insect repellants. I plant these in my in-ground garden to help keep insects away as well. I love, love, love making pesto (see my authentic Italian pesto recipe here) and always plant plenty of basil. 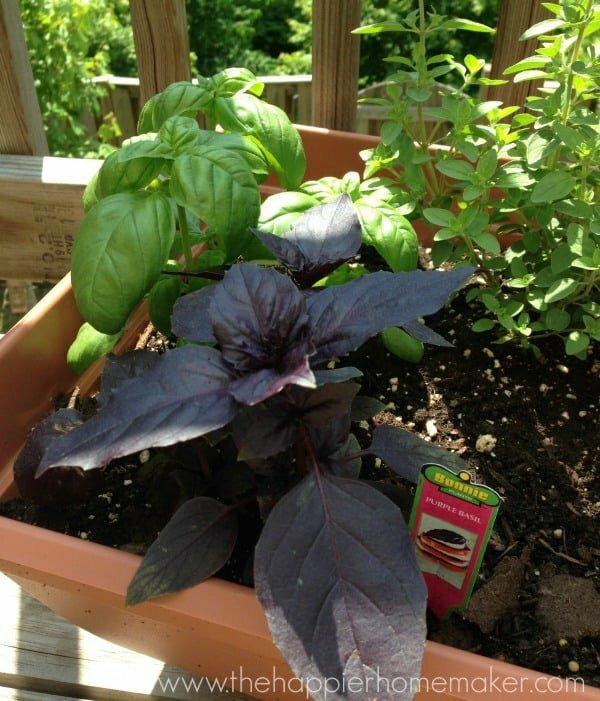 Basil is yet another plant that deters those pesky mosquitos so that’s even more of a reason to plant plenty on my porch each year! Lavender is one of my favorite scents and one of my favorite essential oils so knowing that lavender plants help repel mosquitos is an added bonus, plus I love that I can use it to make my own tea! Peppermint is another plant I always like to have on hand, I love putting peppermint in my water or tea! Peppermint is widely used as a bug repellant-creepy crawlies hate the smell! Peppermint is super easy to grow…my mom always planted it in the damp areas around our air conditioner units because it thrives in wet areas. 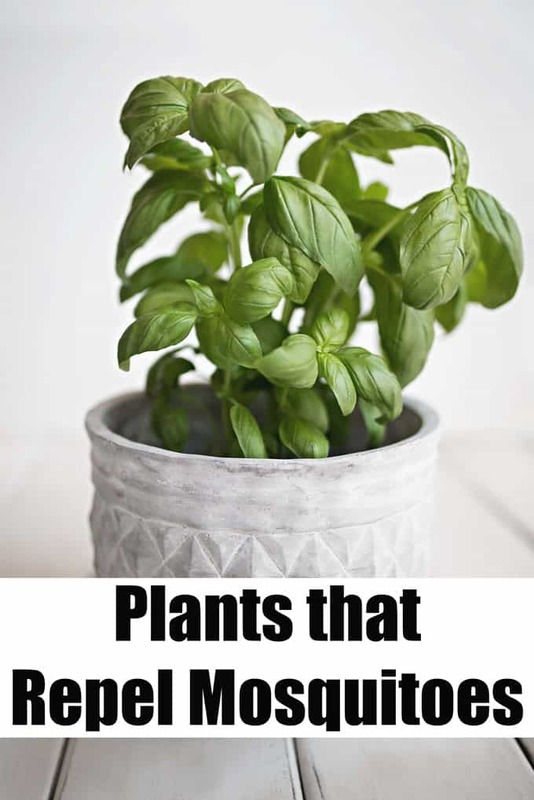 It’s another plant that likes to spread so keep it in a pot if you don’t want it to take over! Do you use any of these plants in your gardening? Which of these is your favorite? Great list! Do you know if Home Depot has Citronella and the other ones from the top of your list? I found my citronella plants at Walmart, but they also have them at Home Depot. The others are pretty common. 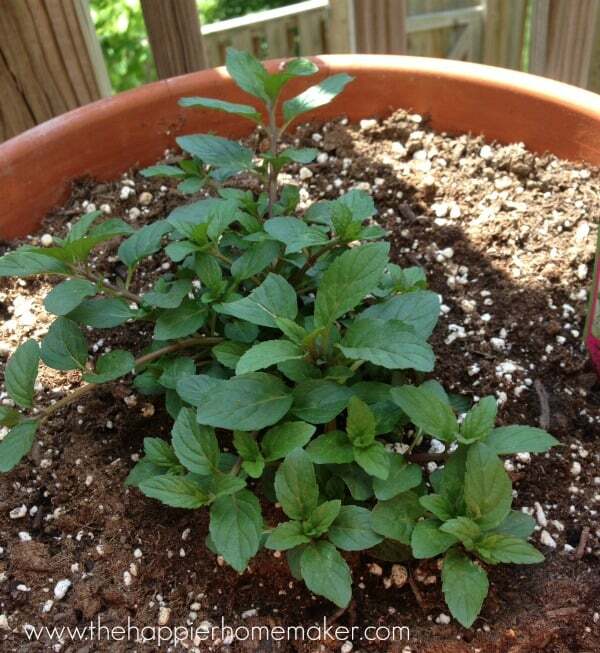 Peppermint is also very invasive, so if you don’t want it to take over, you may want to out it in a pot also. So far I do not use one of those plants for mosquito repellants. I usually use essential oil to protect my family from mosquito. I may change my mind since using those plants will have minor effect on my family. I mean no chemical at all. Just natural ways. Good idea and I will start finding them. Thanks for sharing. None of these plants work unless you r right on top of them. Maybe in a very small area that is somewhat contained. I have citronella plants in pots by my doors. I brush my hand lightly over the leaves before opening the door, and the aroma lifts off the plant. I hardly ever have a bug try to come in. My individual plants grew to 3′ x 4′, which was a surprise, so only need one by each door. I have used marigolds in veggie garden as bug repellant, and it helped, but not with slugs. These are awesome, thanks for sharing, now can you tell me what repels those pesky biting flies??? they are crazy at our camp! I know most all insects hate peppermint Gretchen, I’d imagine a lot of the same plants would work for biting flies too. That’s a great idea Samantha! Great list! I rub peppermint all over myself and the kids whenever we are outside. It’s good to have these plants growing in the garden! I was wondering would it be okay to plant all of these plants together in a pot like a little of citronella,lemon balm, Marigolds and lavender? Thanks for the great tip! Do you know if all of these sold in St.Croix USVI?